75:0.1 AFTER MORE THAN one hundred years of effort on Urantia, Adam was able to see very little progress outside the Garden; the world at large did not seem to be improving much. The realization of race betterment appeared to be a long way off, and the situation seemed so desperate as to demand something for relief not embraced in the original plans. 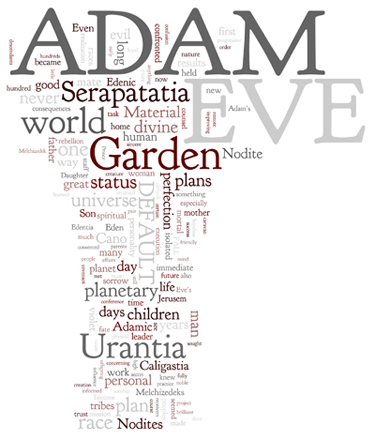 At least that is what often passed through Adam's mind, and he so expressed himself many times to Eve. Adam and his mate were loyal, but they were isolated from their kind, and they were sorely distressed by the sorry plight of their world. 75:1.1 The Adamic mission on experimental, rebellion-seared, and isolated Urantia was a formidable undertaking. And the Material Son and Daughter early became aware of the difficulty and complexity of their planetary assignment. Nevertheless, they courageously set about the task of solving their manifold problems. But when they addressed themselves to the all-important work of eliminating the defectives and degenerates from among the human strains, they were quite dismayed. They could see no way out of the dilemma, and they could not take counsel with their superiors on either Jerusem or Edentia. Here they were, isolated and day by day confronted with some new and complicated tangle, some problem that seemed to be unsolvable. 75:1.2 Under normal conditions the first work of a Planetary Adam and Eve would be the co-ordination and blending of the races. But on Urantia such a project seemed just about hopeless, for the races, while biologically fit, had never been purged of their retarded and defective strains. 75:1.3 Adam and Eve found themselves on a sphere wholly unprepared for the proclamation of the brotherhood of man, a world groping about in abject spiritual darkness and cursed with confusion worse confounded by the miscarriage of the mission of the preceding administration. Mind and morals were at a low level, and instead of beginning the task of effecting religious unity, they must begin all anew the work of converting the inhabitants to the most simple forms of religious belief. Instead of finding one language ready for adoption, they were confronted by the world-wide confusion of hundreds upon hundreds of local dialects. No Adam of the planetary service was ever set down on a more difficult world; the obstacles seemed insuperable and the problems beyond creature solution. 75:1.4 They were isolated, and the tremendous sense of loneliness which bore down upon them was all the more heightened by the early departure of the Melchizedek receivers. Only indirectly, by means of the angelic orders, could they communicate with any being off the planet. Slowly their courage weakened, their spirits drooped, and sometimes their faith almost faltered. 75:1.5 And this is the true picture of the consternation of these two noble souls as they pondered the tasks which confronted them. They were both keenly aware of the enormous undertaking involved in the execution of their planetary assignment. 75:1.6 Probably no Material Sons of Nebadon were ever faced with such a difficult and seemingly hopeless task as confronted Adam and Eve in the sorry plight of Urantia. But they would have sometime met with success had they been more farseeing and patient. Both of them, especially Eve, were altogether too impatient; they were not willing to settle down to the long, long endurance test. They wanted to see some immediate results, and they did, but the results thus secured proved most disastrous both to themselves and to their world. 75:2.1 Caligastia paid frequent visits to the Garden and held many conferences with Adam and Eve, but they were adamant to all his suggestions of compromise and short-cut adventures. They had before them enough of the results of rebellion to produce effective immunity against all such insinuating proposals. Even the young offspring of Adam were uninfluenced by the overtures of Daligastia. And of course neither Caligastia nor his associate had power to influence any individual against his will, much less to persuade the children of Adam to do wrong. 75:2.2 It must be remembered that Caligastia was still the titular Planetary Prince of Urantia, a misguided but nevertheless high Son of the local universe. He was not finally deposed until the times of Christ Michael on Urantia. 75:2.3 But the fallen Prince was persistent and determined. He soon gave up working on Adam and decided to try a wily flank attack on Eve. The evil one concluded that the only hope for success lay in the adroit employment of suitable persons belonging to the upper strata of the Nodite group, the descendants of his onetime corporeal-staff associates. And the plans were accordingly laid for entrapping the mother of the violet race. 75:2.4 It was farthest from Eve's intention ever to do anything which would militate against Adam's plans or jeopardize their planetary trust. Knowing the tendency of woman to look upon immediate results rather than to plan farsightedly for more remote effects, the Melchizedeks, before departing, had especially enjoined Eve as to the peculiar dangers besetting their isolated position on the planet and had in particular warned her never to stray from the side of her mate, that is, to attempt no personal or secret methods of furthering their mutual undertakings. Eve had most scrupulously carried out these instructions for more than one hundred years, and it did not occur to her that any danger would attach to the increasingly private and confidential visits she was enjoying with a certain Nodite leader named Serapatatia. The whole affair developed so gradually and naturally that she was taken unawares. 75:2.5 The Garden dwellers had been in contact with the Nodites since the early days of Eden. From these mixed descendants of the defaulting members of Caligastia's staff they had received much valuable help and co-operation, and through them the Edenic regime was now to meet its complete undoing and final overthrow. 75:3.1 Adam had just finished his first one hundred years on earth when Serapatatia, upon the death of his father, came to the leadership of the western or Syrian confederation of the Nodite tribes. Serapatatia was a brown-tinted man, a brilliant descendant of the onetime chief of the Dalamatia commission on health mated with one of the master female minds of the blue race of those distant days. All down through the ages this line had held authority and wielded a great influence among the western Nodite tribes. 75:3.2 Serapatatia had made several visits to the Garden and had become deeply impressed with the righteousness of Adam's cause. And shortly after assuming the leadership of the Syrian Nodites, he announced his intention of establishing an affiliation with the work of Adam and Eve in the Garden. The majority of his people joined him in this program, and Adam was cheered by the news that the most powerful and the most intelligent of all the neighboring tribes had swung over almost bodily to the support of the program for world improvement; it was decidedly heartening. And shortly after this great event, Serapatatia and his new staff were entertained by Adam and Eve in their own home. 75:3.3 Serapatatia became one of the most able and efficient of all of Adam's lieutenants. He was entirely honest and thoroughly sincere in all of his activities; he was never conscious, even later on, that he was being used as a circumstantial tool of the wily Caligastia. 75:3.4 Presently, Serapatatia became the associate chairman of the Edenic commission on tribal relations, and many plans were laid for the more vigorous prosecution of the work of winning the remote tribes to the cause of the Garden. 75:3.5 He held many conferences with Adam and Eve—especially with Eve—and they talked over many plans for improving their methods. One day, during a talk with Eve, it occurred to Serapatatia that it would be very helpful if, while awaiting the recruiting of large numbers of the violet race, something could be done in the meantime immediately to advance the needy waiting tribes. Serapatatia contended that, if the Nodites, as the most progressive and co-operative race, could have a leader born to them of part origin in the violet stock, it would constitute a powerful tie binding these peoples more closely to the Garden. And all of this was soberly and honestly considered to be for the good of the world since this child, to be reared and educated in the Garden, would exert a great influence for good over his father's people. 75:3.6 It should again be emphasized that Serapatatia was altogether honest and wholly sincere in all that he proposed. He never once suspected that he was playing into the hands of Caligastia and Daligastia. Serapatatia was entirely loyal to the plan of building up a strong reserve of the violet race before attempting the world-wide upstepping of the confused peoples of Urantia. But this would require hundreds of years to consummate, and he was impatient; he wanted to see some immediate results—something in his own lifetime. He made it clear to Eve that Adam was oftentimes discouraged by the little that had been accomplished toward uplifting the world. 75:3.7 For more than five years these plans were secretly matured. At last they had developed to the point where Eve consented to have a secret conference with Cano, the most brilliant mind and active leader of the near-by colony of friendly Nodites. Cano was very sympathetic with the Adamic regime; in fact, he was the sincere spiritual leader of those neighboring Nodites who favored friendly relations with the Garden. 75:3.9 Influenced by flattery, enthusiasm, and great personal persuasion, Eve then and there consented to embark upon the much-discussed enterprise, to add her own little scheme of world saving to the larger and more far-reaching divine plan. Before she quite realized what was transpiring, the fatal step had been taken. It was done. 75:5.1 Eve's disillusionment was truly pathetic. Adam discerned the whole predicament and, while heartbroken and dejected, entertained only pity and sympathy for his erring mate. 75:5.2 It was in the despair of the realization of failure that Adam, the day after Eve's misstep, sought out Laotta, the brilliant Nodite woman who was head of the western schools of the Garden, and with premeditation committed the folly of Eve. But do not misunderstand; Adam was not beguiled; he knew exactly what he was about; he deliberately chose to share the fate of Eve. He loved his mate with a supermortal affection, and the thought of the possibility of a lonely vigil on Urantia without her was more than he could endure. 75:5.3 When they learned what had happened to Eve, the infuriated inhabitants of the Garden became unmanageable; they declared war on the near-by Nodite settlement. They swept out through the gates of Eden and down upon these unprepared people, utterly destroying them—not a man, woman, or child was spared. And Cano, the father of Cain yet unborn, also perished. 75:5.4 Upon the realization of what had happened, Serapatatia was overcome with consternation and beside himself with fear and remorse. The next day he drowned himself in the great river. 75:5.5 The children of Adam sought to comfort their distracted mother while their father wandered in solitude for thirty days. At the end of that time judgment asserted itself, and Adam returned to his home and began to plan for their future course of action. 75:5.6 The consequences of the follies of misguided parents are so often shared by their innocent children. 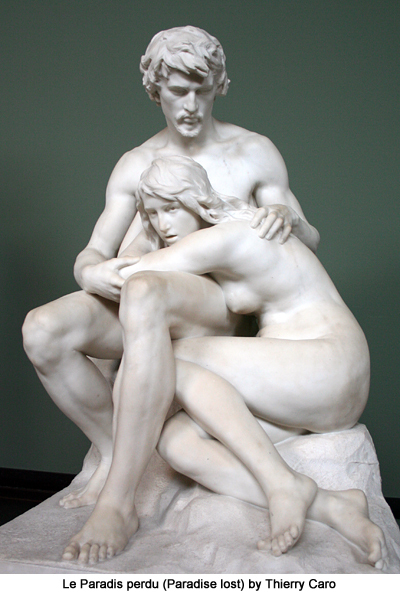 The upright and noble sons and daughters of Adam and Eve were overwhelmed by the inexplicable sorrow of the unbelievable tragedy which had been so suddenly and so ruthlessly thrust upon them. Not in fifty years did the older of these children recover from the sorrow and sadness of those tragic days, especially the terror of that period of thirty days during which their father was absent from home while their distracted mother was in complete ignorance of his whereabouts or fate. 75:5.7 And those same thirty days were as long years of sorrow and suffering to Eve. Never did this noble soul fully recover from the effects of that excruciating period of mental suffering and spiritual sorrow. No feature of their subsequent deprivations and material hardships ever began to compare in Eve's memory with those terrible days and awful nights of loneliness and unbearable uncertainty. She learned of the rash act of Serapatatia and did not know whether her mate had in sorrow destroyed himself or had been removed from the world in retribution for her misstep. And when Adam returned, Eve experienced a satisfaction of joy and gratitude that never was effaced by their long and difficult life partnership of toiling service. 75:5.8 Time passed, but Adam was not certain of the nature of their offense until seventy days after the default of Eve, when the Melchizedek receivers returned to Urantia and assumed jurisdiction over world affairs. And then he knew they had failed. 75:5.9 But still more trouble was brewing: The news of the annihilation of the Nodite settlement near Eden was not slow in reaching the home tribes of Serapatatia to the north, and presently a great host was assembling to march on the Garden. And this was the beginning of a long and bitter warfare between the Adamites and the Nodites, for these hostilities kept up long after Adam and his followers emigrated to the second garden in the Euphrates valley. There was intense and lasting "enmity between that man and the woman, between his seed and her seed." 75:6.1 When Adam learned that the Nodites were on the march, he sought the counsel of the Melchizedeks, but they refused to advise him, only telling him to do as he thought best and promising their friendly co-operation, as far as possible, in any course he might decide upon. 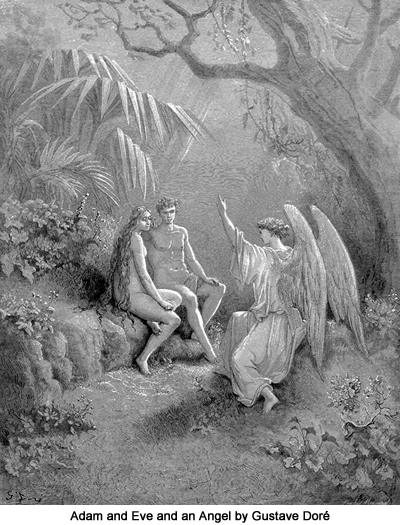 The Melchizedeks had been forbidden to interfere with the personal plans of Adam and Eve. 75:6.2 Adam knew that he and Eve had failed; the presence of the Melchizedek receivers told him that, though he still knew nothing of their personal status or future fate. He held an all-night conference with some twelve hundred loyal followers who pledged themselves to follow their leader, and the next day at noon these pilgrims went forth from Eden in quest of new homes. Adam had no liking for war and accordingly elected to leave the first garden to the Nodites unopposed. 75:6.3 The Edenic caravan was halted on the third day out from the Garden by the arrival of the seraphic transports from Jerusem. And for the first time Adam and Eve were informed of what was to become of their children. While the transports stood by, those children who had arrived at the age of choice (twenty years) were given the option of remaining on Urantia with their parents or of becoming wards of the Most Highs of Norlatiadek. Two thirds chose to go to Edentia; about one third elected to remain with their parents. All children of prechoice age were taken to Edentia. No one could have beheld the sorrowful parting of this Material Son and Daughter and their children without realizing that the way of the transgressor is hard. These offspring of Adam and Eve are now on Edentia; we do not know what disposition is to be made of them. 75:6.4 It was a sad, sad caravan that prepared to journey on. Could anything have been more tragic! To have come to a world in such high hopes, to have been so auspiciously received, and then to go forth in disgrace from Eden, only to lose more than three fourths of their children even before finding a new abiding place! 75:7.7Caligastia did succeed in trapping Adam and Eve, but he did not accomplish his purpose of leading them into open rebellion against the universe government. What they had done was indeed evil, but they were never guilty of contempt for truth, neither did they knowingly enlist in rebellion against the righteous rule of the Universal Father and his Creator Son.